Online restaurant discovery and food delivery company Zomato Media Pvt. Ltd can turn profitable for the year through March 2021, its valuation adviser has projected. But the company will hit the road to profitability only after sinking deeper into the red first, according to the valuation report prepared by Zomato's investment banker Resurgent India. The exercise was part of the documentation required for Zomato's ongoing fundraising efforts and was done primarily to calculate the value of the company's shares. The food-tech unicorn is courting new investors to raise up to $1 billion in fresh funding in a bid to take on main rival Swiggy, TechCircle reported last month. On Wednesday, TechCircle reported that Zomato raised Rs 284.42 crore ($39.7 million) from US-based growth equity firm Glade Brook Capital, in a round that valued it around $2 billion. Nasper-backed Swiggy had recently raised $1 billion at a valuation of $3.3 billion. 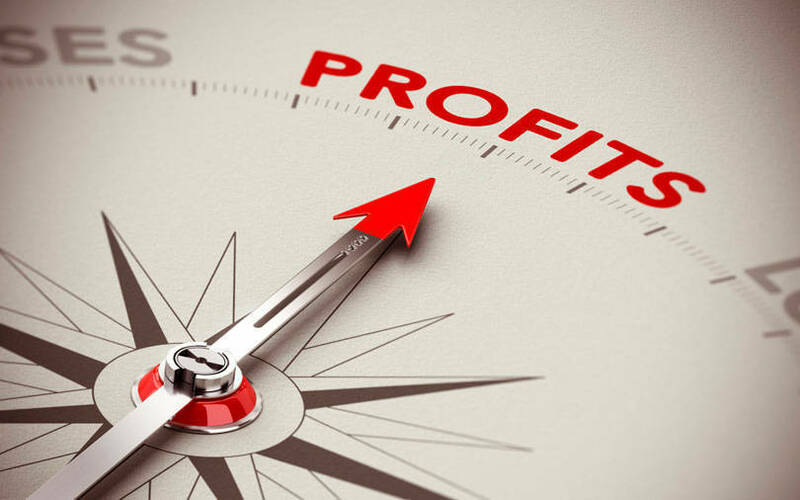 Resurgent India made projections for various financial metrics that include revenue, net profit, earnings before interest, tax, depreciation and amortisation, EBITDA margin, net profit margin and return on equity till the financial year 2022-23. According to the valuation report, the company's loss is projected to widen seven-fold in the current financial year. The loss is estimated to shrink next year and the company may turn profitable in 2021. Profit will soar thereafter. Similarly, revenue is also projected to climb sharply in the next few years, growing more than 10 times in the next five years. Zomato had managed to shrink its net loss for 2017-18 to Rs 106.3 crore, as operating revenue grew 40% while total expenditure fell 1.6%. Resurgent said that the projections were arrived at on the basis of parameters that include historical financial statements and on the basis of information and representations furnished by Zomato. It did not specify what those parameters were. “Online food services sales form a small fraction of the total food services sales pie; however, its prominence is increasing at a rapid pace,” it said, adding that online food services sales grew 1.8 times from 2015 to 2017. Email queries sent to Zomato seeking comments on the projected figures did not elicit a response at the time of filing this report. 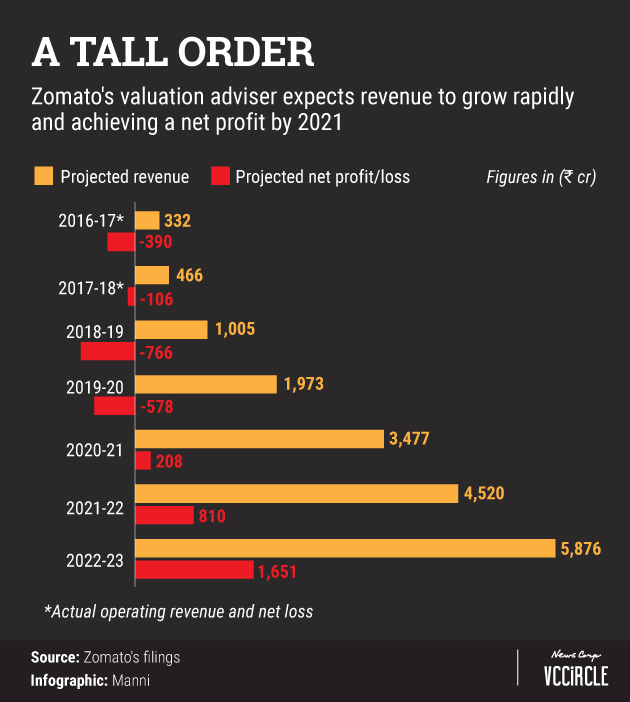 While it is not clear whether Zomato has a strategy in place to meet these projections, some recent developments indicate that it may be on the right track. In September last year, co-founder and CEO Deepinder Goyal had said that Zomato had turned profitable. In a blogpost, Goyal had claimed that Zomato had started to make money across all businesses in the 24 countries it operated. In March last year, Goyal said that the company had hit $100 million in annual revenue run rate, a figure that was attributed to the strong reception to Zomato Gold, its subscription-based offering where users can avail offers on food and drinks on its partner restaurants. At the time of his announcement, it had more more than 150,000 subscribers. TechCircle could not ascertain the latest subscriber numbers. The company's regulatory filings show it is consolidating in core markets and shutting down business in markets that have not shown traction. Zomato shut down its operations in Spain and Sweden during 2017-18, according to the filings. Likewise, media reports said last month the company was looking to sell its UAE business to Berlin-based food delivery major Delivery Hero.